I have known Katerina Tsigarida since she was a post-graduate student at the AA and we worked together, designing houses for Antiparos. She was a promising young architect in the making and that was clear during our collaboration and her contibutions. I have since witnessed her steady development into maturity over the years and it has been a pleasure to follow a personal architectural thinking process, develop into a confident, versatile and accomplished language. Her aversion to rhetoricism is of key importance at a time when much of contemporary architecture focuses on public urban spaces and uninspired superficial exercises in town planning. 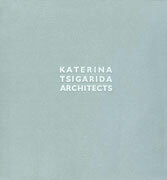 What we obtain, though, from Katerina Tsigarida;s squares and projects is not superficialism. The three dualities mentioned earlier immediately emerge, in parallel to a genuine concern for functionality. Katerina's architecture seems to ignore the problem of expression. It contains a quality that transcends language. The liberation from the problem of language presupposes the liberation from the compulsion of references. The formal idiom turns out to be one of the many elements that constitute architecture: it is equivalent to place, to program, to the character of construction, to users' needs. In an era like the current, where the world of international architecture is used to the doped race for the eccentric originality, this calm attitude proves that Tsigarida's design motives have a persistent and documented durability. It would be easy to attribute her with the merits of a critical vernacularism related to the natural light, the abstraction and the environmental characteristics of Greek landscape, and mainly with the lack of harmony and aesthetic discernment that characterizes Greek urban centres, in which the sovereign element is the uniform and chaotic fragmentation. The ideal of order, that Krokos was seeking, is pursued by Tsigarida using other tools.